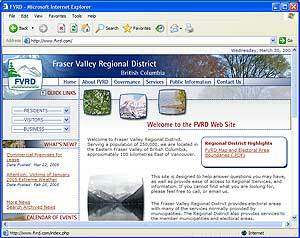 The Fraser Valley Regional District is one of the largest and fastest growing Regional Districts in the province. The geographic area of approximately 13,000 square kilometers stretches from the US border to the south, and as far north as - but not including - Whistler, up the Fraser Canyon and into Manning Park to the east, with the City of Abbotsford and the District of Mission to the west. Also within the borders are the City of Chilliwack, where the main office for the Regional District is located, the Districts of Hope and Kent, the Village of Harrison Hot Springs, and eight Electoral Areas that represent a dozen unincorporated hamlets and the surrounding rural areas. We can offer the job hunter the potential of a career in an area with an affordable cost of living, a temperate climate, and an abundance of recreational opportunities ranging from year around golfing to world class fishing, mountain climbing, and snow sports.